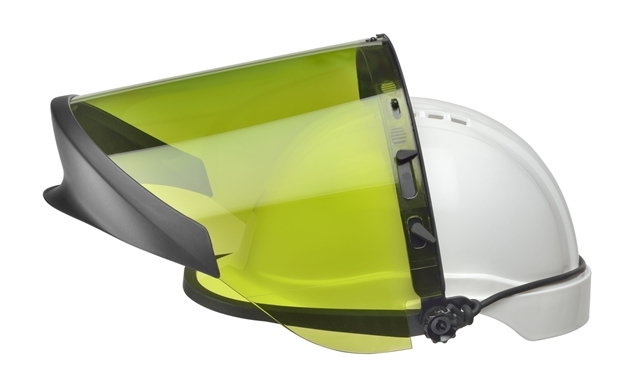 Face Shield (FS20ARC10) - Molded polycarbonate faceshield measuring 250 mm x 470 mm x 2 mm (10 in x 18.5 in x .075 in), providing full wrap protection including a Chin Guard. Tested and certified at Kinectrics High Current Laboratory. ArcSafe® Elvexs ARC shields are proprietary designs, molded of polycarbonate material with special absorbers and made to an industry leading 2mm (0 .075) thickness for maximum thermal protection. Shields come with standard anti-fog coating.